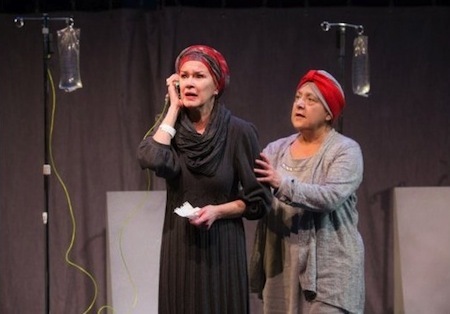 Nightwood Theatre’s production of HER2, currently playing at Buddies in Bad Times Theatre, is the second play about cancer I’ve seen this week; it is also the least satisfying. Despite the astounding ensemble cast, this show just doesn’t pack the emotional punch I was expecting. HER2 is the name given to a protein that promotes the growth of cancer cells. Maja Ardal’s play explores the relationships between seven women—a diverse array—who have tested positive for this protein and have been selected to undergo a clinical trial for a new drug treatment. While these women bond over their shared experience, the lead researcher and her assistant have that age-old argument about science versus sociology. Each woman’s unique personal journey is framed by this question: can hard science be strengthened by unquantifiable human factors like a sense of community? The story is solid, the performances are honest and natural, and the production is visually dynamic. Julia Tribe’s modular set and director Kim Blackwell’s blocking make full use of the large stage and surrounding catwalk. Denyse Karn’s stunning video projections fill in the open area with pulsating imagery that suggests, not only the cold medical scans that haunt these women, but their inner dream worlds as well. So, why did I feel so detached from most of it? Well, thanks to an insightful discussion with my guest, I was able to identify my specific problem: the format. The story is very straightforward, but the script and direction are overly conceptual. I found Monica Dotter’s choreography particularly alienating. These interpretive movement sequences are a physical expression of the shared experience of these women, but… why do we need them? Now, I’ve seen some far-out theatre and I’m all for non-representational, metaphysical flourishes. Such abstractions, however, seem out of place here. As my guest pointed out, the physical and emotional reality of these women is not an abstract notion. Their pain and courage don’t require interpretation. Rather than clarify anything, these very pretty dances actually dilute the emotional intensity. I was also bored with the tired come forward into the spotlight and tell us your story structure of it. The drama works best when the women are conversing as a group. I wanted to stay in that shared space where they comfort and challenge each other. I dreaded the moments when each character would be compelled to break from this dynamic and deliver a monologue. Generally speaking, I found it difficult to connect to the material because of the style of presentation. There were moments, here and there, when the plain human drama shone forth. I was most compelled by Olunike Adeliyi’s portrayal of Anya. Not that her performance stands out particularly, I was drawn to her character because of the manner in which it is revealed. She is the youngest of the women (a teenager) and the least communicative. Where the other women very quickly rejoice in this communal experience, Anya is aloof and distrustful… even hostile. Her eventual acceptance of the other women carried more weight than the other bonding moments because it didn’t come so easily. Hidden inside this inventive production is a very simple yet moving story about women defining themselves by their response to adversity, rather than adversity itself. And an exploration of how, in the delicate balancing act of survival, hope or fear can tip the scales. Sadly, HER2 muddles that story with too much stagecraft. Her2 is runs until February 1 at Buddies in Bad Times Theatre (12 Alexander St). Shows run Tuesday to Saturday at 8PM, matinees are on Saturday and Sunday at 2PM. Tickets are $25 to $45, special PWYC performance on January 20. Tickets can be purchased online or by phone at 416-975-8555.
really constructive review- I think this play needed this dose of tough love to move forward into future projects…- when the actors were given a chance to actually ‘act’ I agree they were solid and compelling- I think you really respected what was good about the show, and def. did a tactful job of what was fatally wrong with it.